The January 2016 Initial Police dog course has been a very eventful course to say the least. 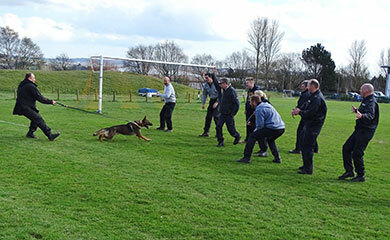 We started the course with Chaos, Comet and Cagney. Cosmic and Charley were spare dogs with no handler allocated to them and so the course and I trained them during the week and they returned to their puppy walkers at weekends. 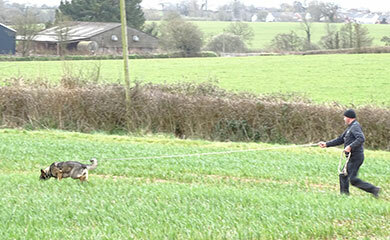 after a very enjoyable day tracking across muddy fields. 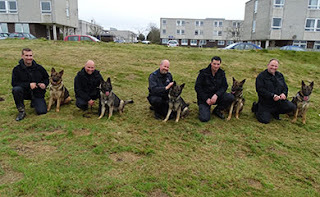 Rear left Comet with Andy, rear right Cagney with Tim, front left Charley with me, front centre Cosmic with James, and front right Chaos with Mark. They are pictured above looking a bit cleaner after building searching. 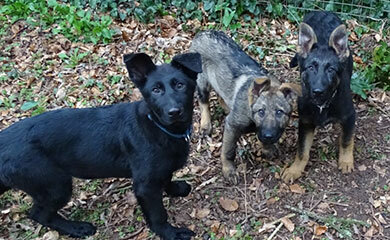 In week 9 I traveled to Germany to collect 3 new puppies Bob, Bernie and Bevan. 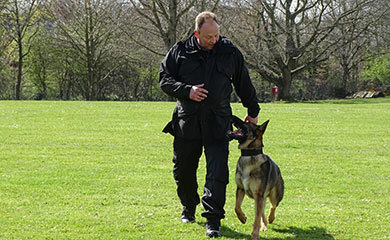 In week 10 we were joined by an additional handler from Dorset Dave Cambell who had recently had to retire his operational dog with a spinal condition and he was allocated Charley our spare dog. 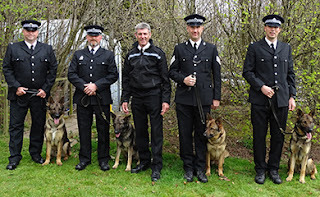 This meant we now had 5 dog teams on the course and we were all pleased for Charley who had been without her own handler since the start of the course. Predictably they are now Chas and Dave. 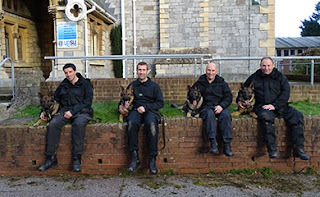 The new team are pictured here together in the centre. 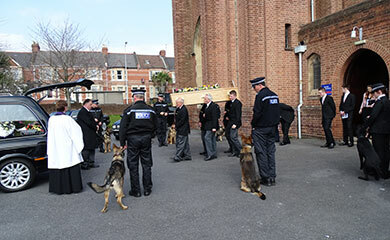 This was also a sad week for us as we attended the funeral of one of our puppy walkers Donna to form a guard of honour. 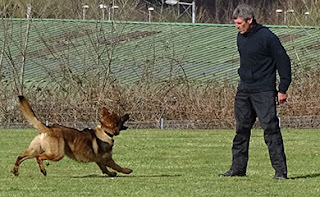 Two weeks later the week of our assessments week 12, I had to make the very difficult decision to release Cagney from the course as she had struggled to make the necessary progression in a number of exercises. 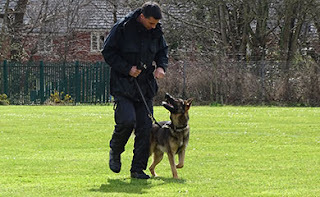 We had seen a deterioration in her performance around week 6 and we had put this down to a phantom pregnancy which was clearly causing her some discomfort and changes in her behaviour. 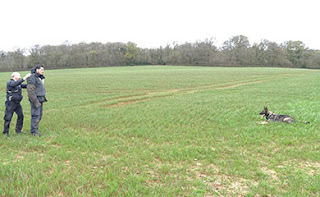 However this didn’t improve after 5 weeks and if anything became more acute. We were all devastated because Cagney and her handler Tim were with us from the start and were part of the team. Cagney now has a new home with Pippa in Devon. Pippa has had 2 previous GSD’S both who lived to the ripe old age of 13 years. 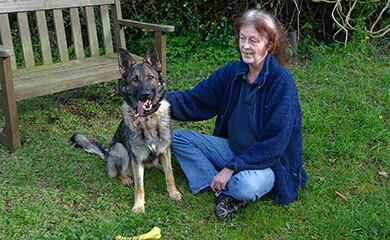 Pippa had lost her last GSD only 3 weeks previously and had made enquiries with all the regional GSD rescue centres for a new GSD without success. Cagney has quickly settled in with Pippa and we will monitor her progress. 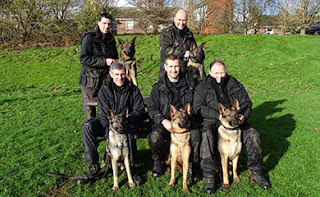 Despite the gloom surrounding Cagney and Tim leaving us we had no time to dwell on it because we had to prepare for our assessments which were in 2 days time. Instructor Mark Avery from Gloucester Police dog section came down on the Wednesday and Thursday and put the remaining teams through their paces. 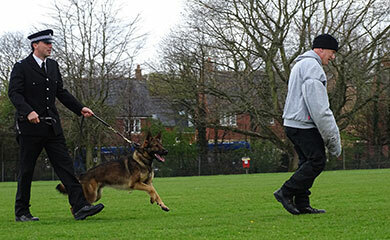 Dawn who puppy walked Comet also paid us a visit on the Tuesday to see how he was getting on with his handler Andy. Mark completed his assessments on the Thursday afternoon and I am pleased to say not only did he pass all 4 dog teams he was very complimentary about the excellent standards. 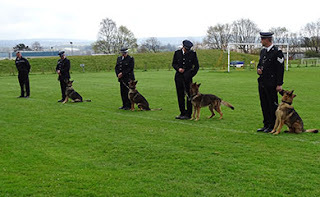 The dogs are assessed on all aspects required of an operational general purpose Police dog. This includes the ability to track and search for both criminals who have fled a crime scene and vulnerable missing persons. Dealing with disorderly crowds and violent criminals. 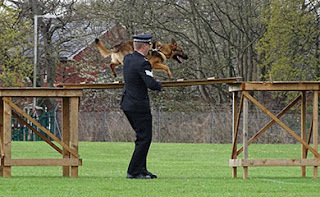 Obedience and agility tests. Searching for outstanding articles and property. Here are the teams performing some of their work on the assessments. The above shows Chaos dealing very positively with a large angry crowd. 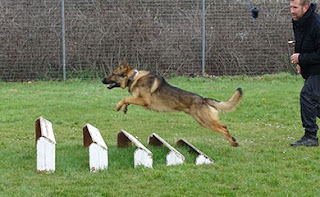 The above shows Cosmic showing his agility clearing the long jump. The above shows Andy and Comet demonstrating their lovely heelwork. 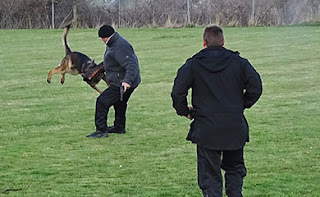 The above shows Andy leaving Comet in a sit stay before he recalls him. The above shows Chaos showing his attentiveness to Mark. 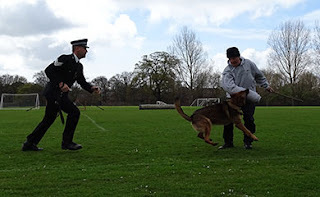 The above shows how determined Chaos is on his criminal work when dealing with an offender attempting to escape. 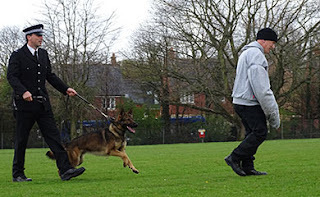 The above shows Cosmic guarding a criminal who has given himself up after running away until his handler joins him. 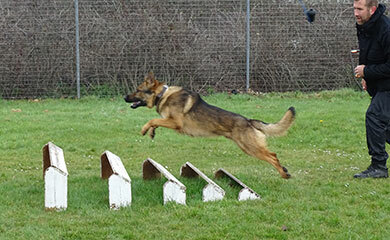 The above shows Mark and Chaos hot on the trail of a burglar who has fled across country before finding him half a mile away hiding in a hedge. 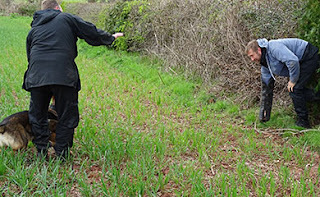 On the test the dogs also have to locate 4 items of property hidden on the trail by the offender. 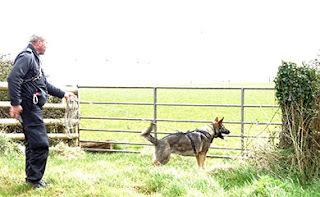 The above shows Charley and Dave tracking across country before finding their offender hiding behind a fence. He is then ordered to come out and is searched by the handler while the dog watches and waits for any sign that the offender might attack his handler. 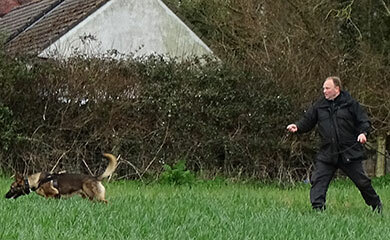 If the offender does that the dog is trained to immediately attack. 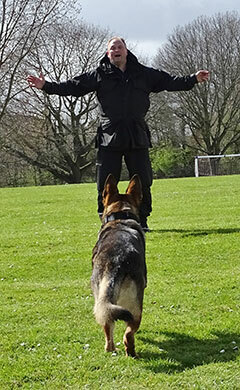 The above shows Chaos recalling to his handler Mark. The above shows us all relaxing with the assessor Mark and all the dogs after completing their assessments and being told that they have all passed with flying colours. 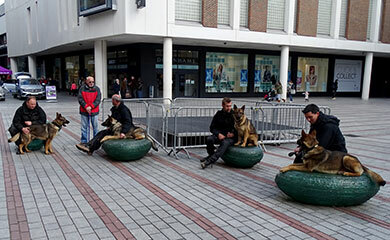 The above shows the dogs demonstrating how calm and relaxed they are in a busy city centre environment. 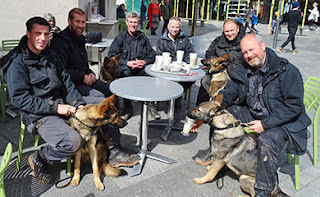 The assessor commented on how unusual it was to see a group of Police dogs so relaxed and trustworthy in such a busy environment and so social together. 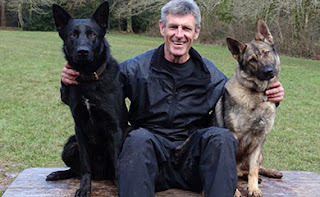 He stated it was a pleasure to see and was clearly the result of the pups growing up together and developing together on our training sessions with our puppy walkers. 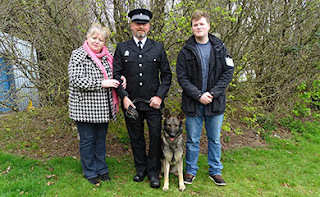 After successfully licensing it was time for a well-earned long weekend break before returning for more practical operational work and preparation for the passing out parade the following week. 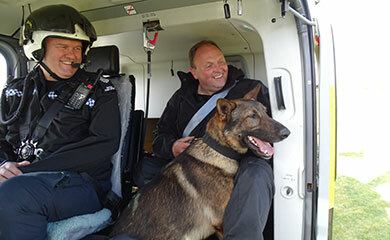 On our final week all the handlers underwent their helicopter familiarisation work where they are required to ride in the helicopter. The above shows Chaos and Mark enjoying the view before take off. The above video shows Cosmic completely relaxed enjoying the flight. 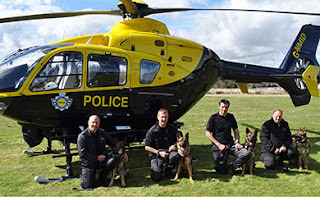 The above shows the teams having a photo together after their enjoyable and successful flights. 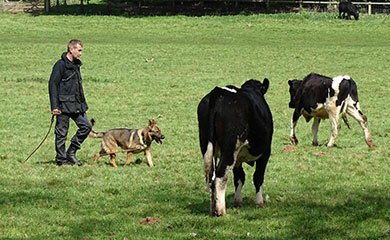 The above shows Cosmic and James undergoing their livestock proofing session on the day before our passing out parade. It is vitally important for our Police dogs to be neutral and totally reliable around livestock because we regularly have to work in amongst all types of livestock when searching rural areas for criminals and missing persons. 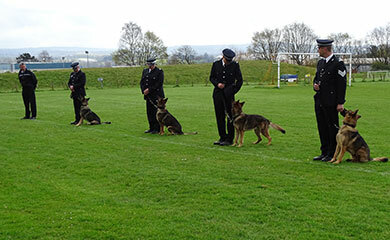 Finally our final day arrived when all the teams officially leave the course after their passing out ceremony. The ceremony is a chance for us to share the day with our families and to say a big thank you to all of our puppy walkers who make the whole thing possible. 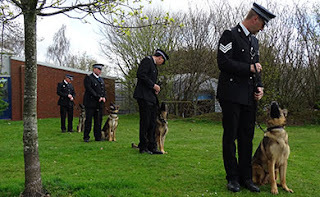 The above shows the teams about to march to give a short demonstration of the heelwork, agility and criminal work to the crowd. 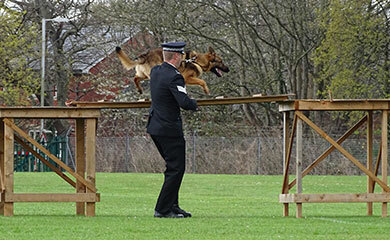 The above pictures show the handlers giving a demonstration of their work. 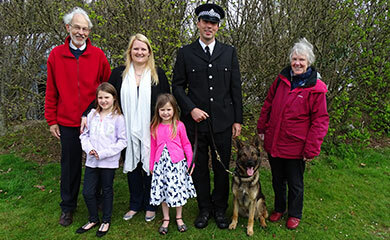 The above shows James and Cosmic with their family. 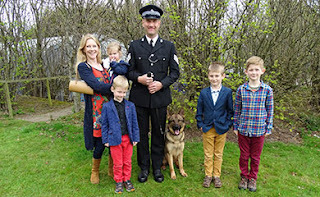 The above shows Dave and Charley with their family. The above show shows Andy and Comet with their family. 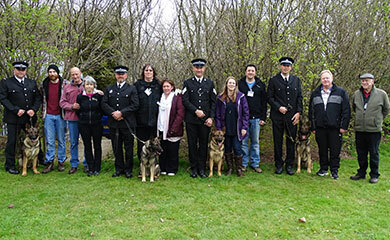 Finally this picture shows all the dogs with their puppy walkers and handlers after a long and enjoyable course and a very enjoyable day. For me it was a very emotional day seeing my C litter finally leaving to start their Police careers because it only seems like yesterday I watched them all being born to mum Ruby in our house. That is all of our 3 litters the A,B & C now out and serving operationally. We have 15 operational Police dogs serving out of the 22 pups we have raised from our 3 litters. The 7 pups who did not make Police dogs are all thriving in pet homes and all of their owners comment on what lovely characters and temperaments they have. 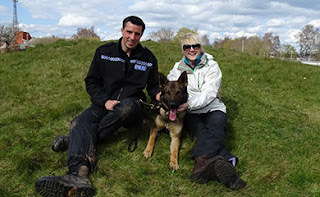 We are now waiting to see if Sasha has been successfully mated to our dog Lenny and whether a D litter is on the way. As for me no time for a rest as on Sunday I will be running a fun style competition for all of the 7 dogs for the September 2016 Police dog course and their puppy walkers. Until next time goodbye from Sasha, Lenny and me.